Miró painted ‘Le Courtisan Grotesque 3’ in 1965 following a request by his friend, the printer and bibliophile of Russian origin Iliazd (born Zdanevich Ilia). ‘Le Courtisan Grotesque 3’ presents the main qualities of the poetic artist: in it, the viewer can read vibrant lyricism, vital energy, sense of humor and the tragedy of life. 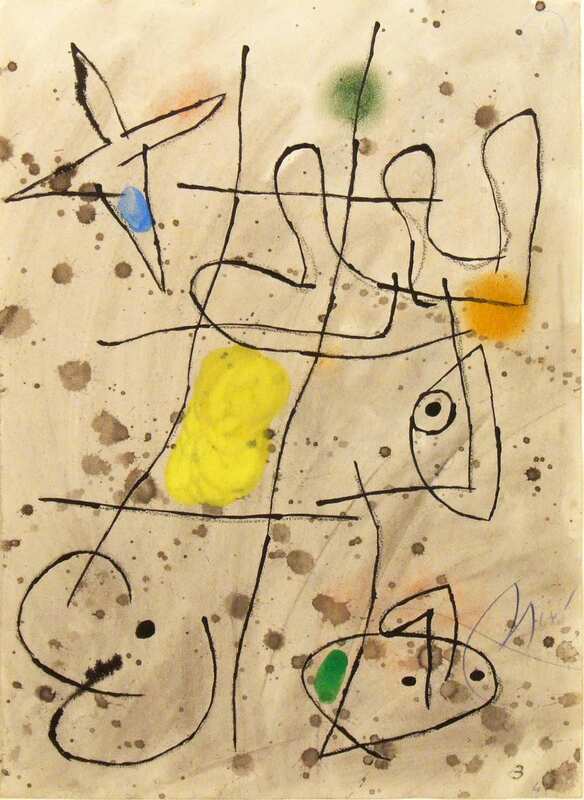 Among the spots of color and the schematic lines, and the sinuous and fragmented rhythms, one is able to recognize Miró’s lexicon: abundant astral signs (suns, moons and stars), fragments of human figures (such as breasts and torsos), primary colors and bizarre fauna.